Hello and welcome to our brand new blog! We are delighted to bring you monthly updates on our current progress, share exciting news stories and events as well as keep you informed of our next steps. Whether you are a club member or simply live locally in the community, you are at the heart of our project and we want to include you every step of the way. First things first, how much progress have we made so far? The project is a 3-phase process and the hub team have been working hard behind the scenes to get things moving at the park. We are currently in phase 1 of the project and we are delighted to announce that new utilities and a storage garage will be put in place. We have also created new signage that will be situated at each entrance to the park so keep an eye out for this coming soon! As the age old saying goes… money doesn’t buy happiness (but it sure does help to build a facility)! We have been extremely lucky to have received funding for our project so far from local area budgets including Fife Council, not to mention the fantastic support our own club members and local community council have given us. With any project such as ours, funding is at the root of success and without vital funds our vision to make this dream a reality simply won’t happen. This is where you can help! We have made an easy way for you to donate anything you can towards the hub project, whether it be 50p or £50, every single penny will help. With just a couple of clicks you will have helped to not only create a facility that will benefit yourself, but actually change the lives of less fortunate people who live in our town. Please share our crowd funding page with your family, friends and colleagues – thank you in advance. Let’s not forget the reason we want our project to be a success is so that we can create a safe and fun environment to inspire the next generation. 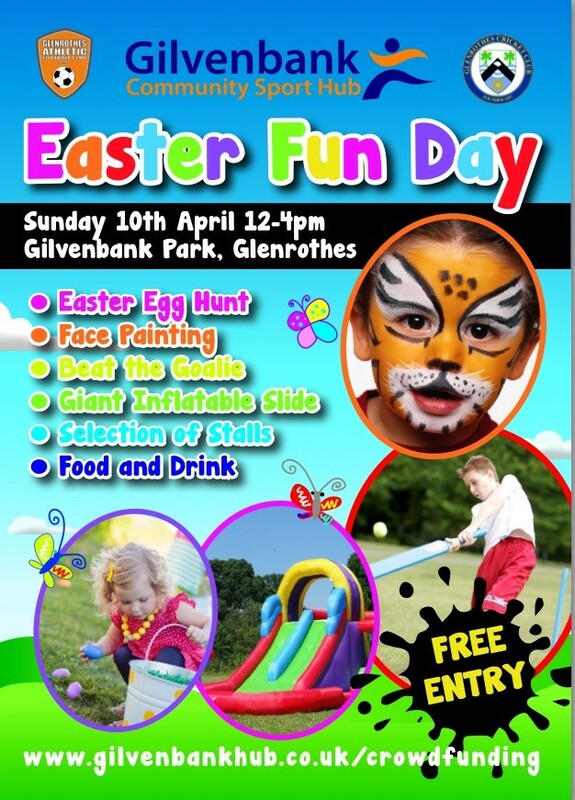 We are very excited to be hosting a family event at Gilvenbank Park on Sunday 10th April 12 – 4pm and we would love for all of you to join us! 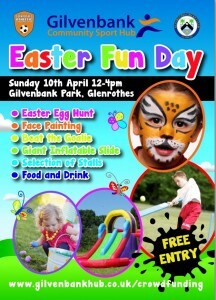 Take part in our Easter egg hunt adventure, go wild and paint your face like a tiger, kick some balls to beat the goalie or simply browse our fantastic selection of stalls! 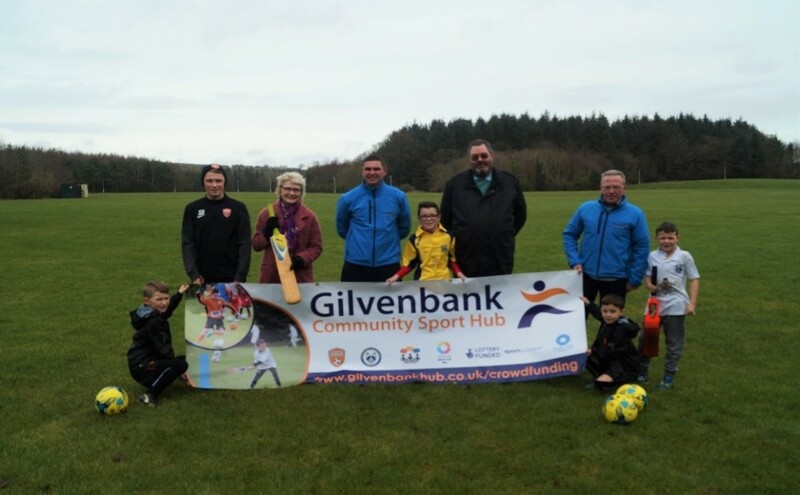 If you are interested in finding out more information about Glenrothes Cricket Club or Glenrothes Athletic Football Club come along and speak to our club members who will not only be happy to answer your questions but will also be providing free taster sessions. We will also be on hand to provide information on the hub project! There really is fun to be had for all the family so come along and see for yourself on the day – FREE ENTRY! We are moving full steam ahead to develop the hub in 2016. Our main focus is to raise vital funds so that we can start building the facility. We will continue to work closely with North Glenrothes Community Council and Fife Council to finalise the design and layout of the hub facility and we will also be teaming up with Fife Orienteering to bring Orienteering to the park. Exciting times ahead! No Replies to "Hello and Welcome!"